The Derriford, Devonport, Exeter and Truro Dental Education Facilities are NHS training clinics for the Peninsula Dental School Students. As the service is provided by dental students in training who are supervised by highly experienced dentists, all care and advice provided by the dental students is free of charge to all patients. Dental treatment is provided within an educational setting, and so the examinations, treatment and oral hygiene care may take longer to complete than usual. Sufficient time for treatment is always allocated to ensure you receive the highest quality of patient care. 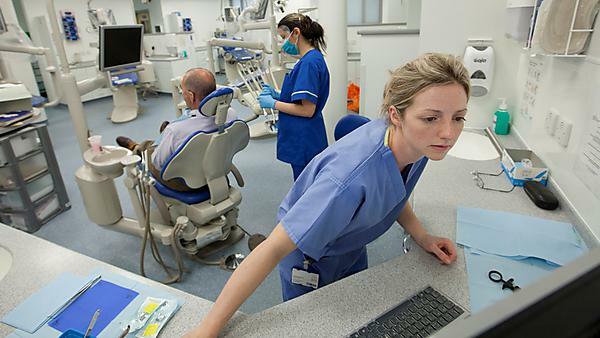 Most of the treatments provided in any NHS general dental practice are available. Dental check-ups, oral examination (including X-rays) and diagnosis. If certain types of treatment cannot be provided by the students you will be provided with advice about how to arrange the treatment that has been recommended. Please note - for any further treatment provided by an NHS dentist outside of the Education Facility the usual NHS patient charges for dentistry will apply (unless you qualify for free NHS dental treatment). If you choose to go to a private dentist or private consultant, then private charges will apply. The clinic is open by appointment only between the hours of 9.00am - 4.30pm. Please telephone +44 3451 558109 to arrange an appointment during these working hours. If you wish to leave a message out of hours, please do so and we will call you back when a member of staff is available. We operate a waiting list so you may be asked to leave your details so we can contact you when an assessment appointment becomes available. If you prefer to be transferred to the NHS waiting list we can advise how to do that. Not everyone will find the Peninsula Dental School suitable for their dental treatment as we are not able to guarantee fixed appointment times and set days as the students work to a university rota, which may be changed at short notice. There may be occasions when we have to refer your treatment to a different student depending on timetables and this could mean we may also occasionally have to ask you to consider travelling to either of our two dental facilities at Devonport and Derriford. Please consider these points carefully if you decide to have treatment at the Peninsula Dental School. If you are unable to keep your appointment, please let us know as soon as possible so that we can allocate the appointment to someone else. If you fail to attend more than two consecutive appointments we will have to put you back on our waiting list. If you are currently under the care of the Dental Education Facility and require an urgent or emergency appointment you should telephone NHS Plymouth's Emergency Dental Access Centre between the hours of 8.45am - 5pm Monday to Friday on +44 8451 558070. Please let the Dental Access Centre know that you are a patient of the Dental Education Facility. If you require urgent appointment during the evening or weekend the please contact Devon Doctors on Call on +44 1392 823682. Peninsula Dental School students - Where will I be based?